Secretary General of the Regional Cooperation Council (RCC), Goran Svilanovic, briefed today the diplomatic community in Sarajevo of results in implementing the RCC Strategy and Work Programme 2011-2013, the outcome of the RCC Annual Meeting held in Ohrid last month, and the state of regional cooperation in South East Europe. Secretary General Svilanovic informed that participants of the Annual Meeting, as well as the Ministers of Foreign Affairs of the South-East European Cooperation Process (SEECP), gave full support to the RCC's work thus far, as well as to the new work programme of the organization for the period 2014-2016. "The key element of the new RCC work programme is South East Europe (SEE) 2020 - a Job-Creating Growth and EU Integration Strategy, as the organization's response to the mounting socio-economic problems in the region", said Svilanovic. "Through SEE 2020, the region would target an employment growth rate by 12%, an increase in mutual trade by 230%, and a rise in its GDP from the current 38% to 46% of the EU average." "The RCC's goal is to create a harmonised framework in regional cooperation, where all participants have clear roles and responsibilities in achieving the agreed goals within the SEE 2020 strategy. We expect that SEE 2020 will be adopted by the end of 2013." Secretary General Svilanovic recalled the ability of the RCC to ensure all-inclusiveness in its work as another major success of the organization. He congratulated Croatia on becoming an EU member in two weeks, underlying the importance of European perspective for all of the Western Balkans. The RCC Secretary General thanked Jelica Minic, the outgoing Head of Expert Pool at the RCC Secretariat, for her invaluable contribution and utmost dedication to the RCC and regional cooperation in South East Europe in the course of the past five years. 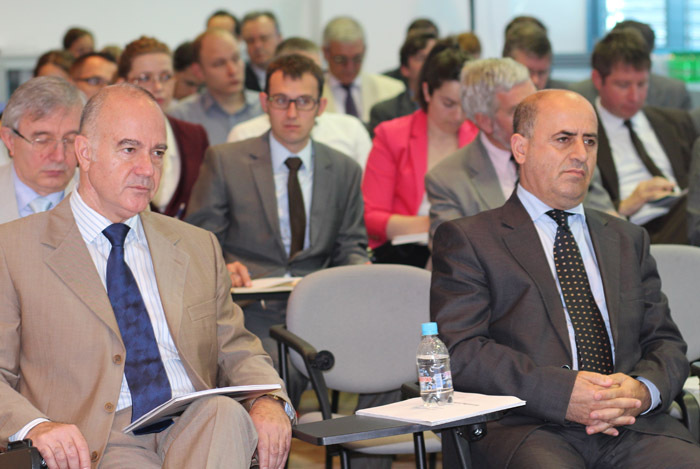 The briefing gathered some 30 representatives of the diplomatic community in Sarajevo.